Hello hello again my lovely friends. 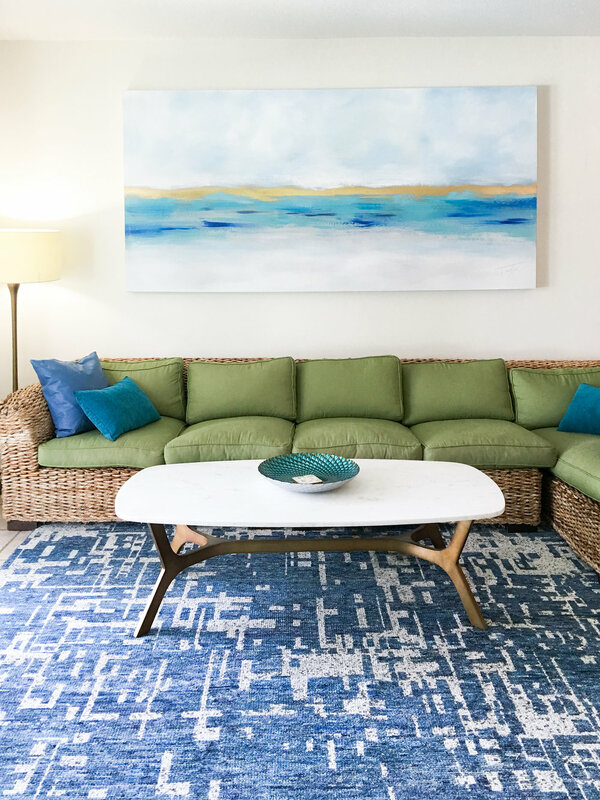 So in my last post I showed some before and after pictures of the condo renovations Bryan and I worked on for two weeks while in St. John (if you missed it, you can read the post here.) Along with those renovations, I also did 4 custom abstracts for the condo. Bryan built the two largest canvases (4x8ft and 3x5ft) with oak we got from Home Depot on St. Thomas and rolled canvas we had shipped down. The other two canvases we luckily found at the local hardware store (30x48in). Remember this painting? I did this one over 3 years ago for their first condo, Blue Coral. It makes me so happy that I now have 5 original paintings in St. John since that is the place that inspires most of my work. Linda (the world's greatest mother-in-law) is THE BEST for letting me go crazy with paint and allowing me to paint an 8ft piece for the first time ever for her place. Painting on the porch next to the pool with an ocean view? Um YES PLEASE. So pleased with how this painting turned out (30x48in - one of the canvases we bought). It is hanging in the little reading nook area in the master bedroom. Bryan should sell his canvases. They are better than the heavy duty gallery wrapped ones I normally get from Michaels. THANKS BRY BRY. Bryan built this canvas (3x5ft) and it hangs above the bed in the second master bedroom. This piece was inspired by the moody pieces I have recently done, like this guy. It is 30x48in and hangs in the third bedroom. BRYAN YOU ARE THE GREATEST MAN ALIVE. Here he is making the 8 footer!! It came out so sturdy and perfect. Soooo happy with how this baby turned out! (4x8ft!!!) I love painting large scale art, it's such a fun challenge. Here's a fun time lapse video Bryan captured of me starting the big painting! Anyone want a custom piece of artwork made? Email me. I'm serious. 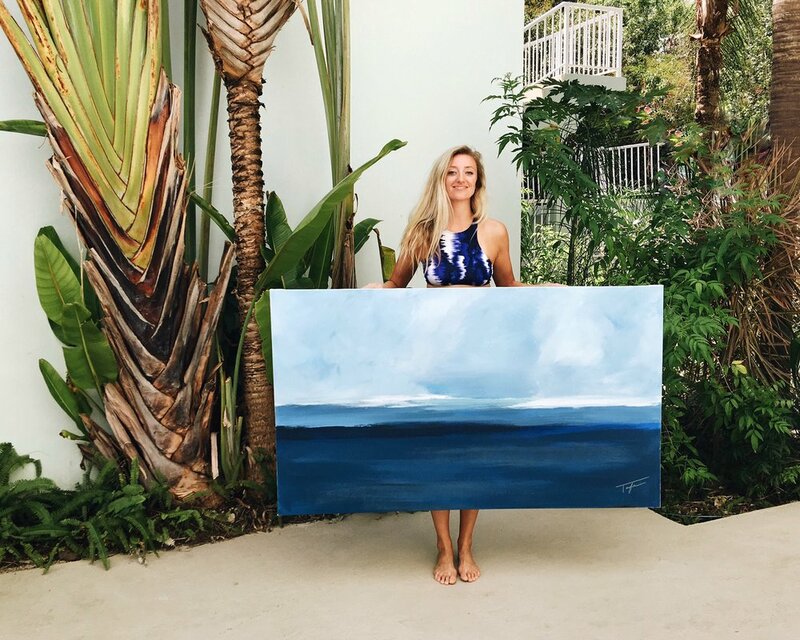 I want to paint a beautiful statement piece for your home (or vacation home). I'll travel anywhere. Be sure to check out the before and after pics of this condo's renovation HERE. Other fun posts: MY ST. JOHN TRAVEL GUIDE and THE DO'S AND DON'T OF ST. JOHN!